Coats’ Disease is a very rare condition found in children and adults where there is abnormal development in the blood vessels behind the retina of the eye. The blood-rich retinal capillaries break open, leaking the serum portion of the blood into the back of the eye. The leakage causes the retina to swell, leading to partial or complete detachment of the retina. Coats’ Disease progresses gradually and affects central vision. It is almost always unilateral (affecting only one eye). If caught early, some level of vision can typically be restored. If not treated until its later stages, complete loss of vision can occur. In the final stage, enucleation (removal of the affected eye) may be necessary. It’s estimated that about 69% of the cases are male. The average age at diagnosis is 8–16 years, although the disease has been diagnosed in patients as young as 4 months. The peak age of onset is between 6-8 years of age, but ranges from 5 months to 71 years. About two-thirds of juvenile cases present before age 10 years; approximately one-third of patients are 30 years or older before symptoms begin. Coats’ Disease does not appear to be inherited and has no reported racial or ethnic predilection. Read some of our stories of patients and families battling Coats’ Disease. Who is affected by Coats' Disease? It’s estimated that about 69 percent of the cases are male. The average age at diagnosis is 8–16 years, although the disease has been diagnosed in patients as young as 4 months. The peak age of onset is between 6-8 years of age, but ranges from 5 months to 71 years. About two-thirds of juvenile cases present before age 10 years; approximately one-third of patients are 30 years or older before symptoms begin. Coats’ Disease does not appear to be inherited and has no reported racial or ethnic predilection. Read some of our stories of patients and families battling Coats’ Disease. What are some of the early Coats' Disease symptoms and signs? Experts agree that children who exhibit the following early warning signs should seek an evaluation immediately from an optometrist or ophthalmologist. Yellow-eye in flash photography. Just as the red-eye effect is caused by a reflection off blood vessels in the back of a normal eye, an eye affected by Coats’ will glow yellow in photographs as light reflects off cholesterol deposits. Visit knowtheglow.org for more information. Signs of loss of depth perception and parallax. When an eye is affected by Coats’, the unaffected eye will often compensate for the loss of vision, resulting in some loss of depth perception and parallax. Deterioration of eyesight in either the central or peripheral vision. This deterioration is likely to begin in the upper part of the vision field, as this corresponds with the bottom of the eye where blood usually pools. What should I do if my child shows Coats' Disease symptoms? Don’t wait—talk immediately to your doctor about the possibility of Coats’ Disease. Time is of the essence for saving the eyesight. Recognizing early signs of Coats’ and knowing developmental milestones is important, and early intervention is key. Click here for a list of the most important questions to ask your doctor. I think my child has Coats' Disease, but neither my child’s pediatrician nor my child’s eye doctor has heard of it. Where do I find a Coats' Disease specialist? You can start by making sure you have a reputable doctor and eye doctor on your side. Don’t stop there. Ensure that teachers, therapists, coaches, friends and family understand what the disease is and can respond to his/her needs appropriately. 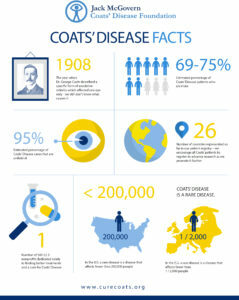 The JMCDF can help as a resource on Coats’ Disease. Doctors on our website are available and have agreed to direct you to the nearest knowledgeable physician in your area. It helps enormously to plug into an already existing network of parents facing the same challenges as you, so utilize our website and message boards to communicate and find hope and answers. When my child is being evaluated for Coats' Disease, what signs does the doctor look for? Coats’ Disease is often misdiagnosed, so it is very important that you work with an ophthalmologist experienced in managing the disease. One challenge to making an accurate diagnosis is that the patients are often young people who can’t articulate their physical problem. Another is that the presenting symptoms of Coats’ can resemble other conditions such as retinoblastoma, which is potentially life-threatening. Make sure you consult our doctor directory to find an ophthalmologist near you. By definition, patients with Coats’ Disease do not have any other health problems. However, typical Coats’ symptoms may appear in several multisystem disorders, such as Facioscapulohumeral Muscular Dystrophy, Pericentric Inversion of Chromosome 3 and Alport Syndrome. Again, one clue to a proper diagnosis is that Coats’ Disease is typically only clinically symptomatic in one eye. As you can see, this is a complex disease to diagnose, and highlights once again the importance of working with physicians who are familiar with this condition. What Coats' Disease treatments are available to my child? Dr. Michael Jumper answers the question this YouTube video. Avastin injections are a treatment option available to patients with leaking blood vessels. Read on about what you need to know about Avastin injections for Coats’ Disease. Read on about what you need to know about laser therapy for Coats’ Disease. How many people in the United States are diagnosed with Coats' Disease? Less than 200,000 people in the US population are affected. It’s listed as a “rare disease” by the Office of Rare Diseases (ORD) of the National Institutes of Health (NIH). To put this in perspective, Ophanet, a consortium of European partners, currently defines a condition rare when it affects only one person per 2,000. How does Coats' Disease in children develop? No one knows. It’s still a mystery to retinal specialists. At one time it was believed that it may be caused by a somatic mutation of the NDP gene although follow-up research has not born this out. More study is required. The Foundation is supporting ongoing research at Genentech to examine the genome of Coats’ patients and their family members to try to discern the cause of Coats’ Disease. There is no obvious answer at this time. We are working to provide researchers with access to data and information about patients and with access to samples of fluid and tissue from diseased eyes. The patient registry with Invitae and the new biobank at Johns Hopkins will aid us in encouraging further research into this disease. Is there a cure for Coats' disease? Unfortunately, experts have been unable thus far to find a cure for Coats’ Disease. Many treatments and therapies have surfaced to help the patient retain as much of their eyesight as possible, but no one yet has determined how to reverse the loss of eyesight. Fortunately, with the advent of the Jack McGovern Coats’ Disease Foundation, there is hope for a reprieve and even a cure. Thus far, parents have been relying on early intervention by knowledgeable physicians to mitigate childhood blindness or loss of eyesight. JMCDF is funding a select group of research scientists dedicated to finding a solution for this growing problem. Current treatments have proven to be very successful, helping many kids lead a full and active life, but the Foundation is holding out for more. Are my headaches a symptom of my Coats' Disease? This answer comes from Dr. Arthur Fu, an ophthalmologist who treats Coats’ Disease patients. Please consult your eye doctor for medical advice. Discomfort or pain, either in the eye, or even in the form of a headache is possible, but this is dependent on how “sick” or badly injured the eye is. In most forms of Coats’ Disease only the retina is involved, and because the retina does not have nerves that feel pain, all patients experience loss of vision that is painless. The possibility of pain becomes more likely if Coats’ progresses to more severe forms such as neovascular glaucoma (bleeding in the eye causing high eye pressure), or corneal damage (the cornea has exquisite pain sensation). So, if the retina is involved, I do not expect headaches to be a symptom of Coats Disease. How do I cope when my child has been diagnosed with Coats' Disease? First, be kind to yourself. It’s not easy to recover from the shock of learning your child has a disease that has no known cause or cure. Accept any and all feelings the diagnosis may elicit, and try not to blame yourself: It would’ve been impossible for you to figure out a way to shield your child from this disease. The next step is to arm yourself with all the facts about the disease and understand that it is not a life-threatening situation. Don’t let others write the end of your story. Many times the best intentioned people will say “there are many organizations to help with the blind.” Your child is not blind and rarely does the disease affect both eyes. Knowledge is power, and the more you know, the more capable you’ll feel about navigating the daunting healthcare system. That said, it’s also important to communicate with other patients and parents when it becomes too overwhelming. And if you find that the diagnosis has been so crippling that you’ve been unable to get past it, consider talking to a counselor or therapist. You can’t—and aren’t expected to—weather this storm alone. Finally, make sure you get a second opinion from a knowledgeable doctor. You can join Facebook groups for parents and patient families for extra support. How will my child live with Coats' Disease? Will my child be able to have a normal life? Yes. Much depends on where your child falls on the Coats’ Disease spectrum, but with your support, as well as that of doctors, therapists and teachers, your child does not need to be held back by this diagnosis. Please consider making a donation to help us continue our work of funding research and raising awareness for Coats Disease.